The Monty trial shoe at a hefty price tag of about MYR400 or £89.99. Ain't it a beau? As you can see they are pretty worn out. 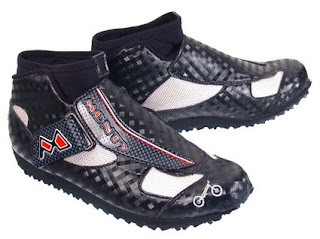 So now I am looking for a new pair of shoes for trials.... HAhah. Anyway, here are some of my personal experiences, which I wanted to share, that sort of explained why trial shoes are designed in certain ways... like the pair of Monty trial shoes above. This one is a biggie! One time, while I was trying to pedal up onto a platform, I slipped on the pedal and my shoe lace was caught on the pedal's grip (see following photos). Hence, I could not use my feet effectively to counter balance myself and landed badly. Luckily my injuries were very minor. Now imagine those pros in a competition, the sections would be hard and punishing. They cannot afford to let something like a shoe lace getting tangled on something to screw up their ride! I think this is the reason why the Monty trial shoes (and probably all cycling shoes) were designed without laces and instead used Velcro to fasten the shoe. Very often, my ankles get injured when I accidentally hit them against the side of the bike frame. During tournament, it is compulsory for riders to wear a pair of shoes that cover the ankles. I can totally understand why this rule is necessary. Trial bike platform pedals are required to have "super" grip... LOL. I think we all can understand why. This will enable the rider to get a good control of the bike. Almost 100% of the rider's ride is dependent on his feet getting a good grip on the pedals. Hence, the need for the shoes to have thick sole and not too soft that it gets damaged easily. A rider also needs to be able to "feel" the pedal beneath his feet. I have had 2 pairs of shoes that had worn out at the sole, to the extend that I could really feel the pedal's "teeth"... LOL. And so, now I am on the hunt for a new pair of shoes for trials. Probably something like the one below.